Well, those of you waiting for the Sigma 18-50mm F/2.8 review will be disappointed. That lens turned out to be a disaster. I messed with it for a week and finally sent it back under warranty. I can only hope they say it's defective, if they say it's normal and indicative of the product, it'll be the absolute worst lens I've ever seen. The problem is extremely soft left side results at all but F/16. But why would I buy an F/2.8 lens if I have to use F/11-F/16. You should see the full frame results at 50mm and F/2.8---unbelievably horrible! You'd be better off with a Coke bottle. But lets wait and see, maybe Sigma will send me a new one or fix it and everything will be OK.
On to some good news, I've got the little Panasonic Lumix DMC-FX100 in my hands and will start a pre-review page within a couple of days. I like the pre-review idea because I can build the review while reporting what I find immediately, rather than waiting a month or so. People who are interested in buying one can find out quicker what's good and what's not so good. I finished the full review of the Tamron 18-250mm lens. It's my longest to date with plenty of screen shots. This is a good cost effective alternative to the factory offerings if you factor in a good close macro and a little extra reach. Up next is the fast Sigma 18-50mm F/2.8 macro. 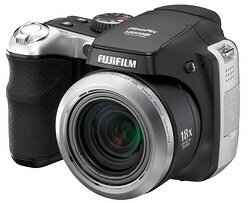 Fujifilm FinePix S8000fd Specs here. Now Fuji enters the ring with their own 18x zoom. This time it's a 27-486mm F/2.8-4.5 in which the lens by the way, looks identical to my Olympus SP-550UZ. It think all the 18x lenses are made by the same company and the focal length range is a matter of sensor placement. I also noticed in the original press pictures some red fringing which I've shown, it's the same picture, just cropped at 100%. They took this studio shot with a 12MP camera according to the file, and I'm not really impressed with them. 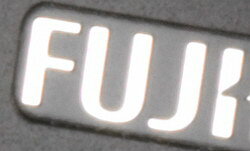 anyways, here's some quick specs on the Fujifilm FinePix S8000fd. 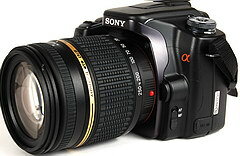 * 27-486mm F/2.8-4.5 optical zoom lens. * LCD 2.5" 230,000 pixels. * 58mb of internal memory. * SD, SDHC, and of course xD cards. * Available in September '07 for $399. 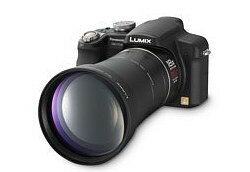 Panasonic enters the super zoom field with the Lumix DMC-FZ18K. At first I though they were using the Olympus SP-550 UZ lens, but now I see there's some difference in the front design and the lens rating; Olympus lists F/2.8-4.5, Panasonic F/2.8-4.2, no big deal anyways. Here's some quick specs for the little super zoom. * ISO 100-6400, can't wait to see that. * Intelligent auto mode...we'll see about that! * Face detection for up to 15 faces! * Continuous shooting...3fps up to 7 images. * Built in 27mb memory. SD, SDHC, MMC cards. for a 20mm to 857mm range. * Shutter 60sec to 1/2000. * Your choice of silver or black bodies. * On sale, September '07 $399. Done! Go here for a complete review of the Tamron 18-250mm lens. I'm having quite an ordeal trying to take my lens test pictures. It's been cloudy and stormy here in Tucson for the past week. But---Keep an eye out for my next lens review; this time it's the Tamron 18-250mm zoom. Hopefully I can post it by Wednesday the 25th. I'll follow that up quickly with the Sigma 18-50mm F/2.8 EX macro that I promised a week or two ago. The former is my first Tamron lens and it took me a while to figure out the somewhat difficult high points. I'm going to compare it generally to the Sony/KM 18-200mm. Also, I'm re-doing my older lens reviews to better reflect real world situations. I hope to have everything up to date in a month or two. Lastly, I'm going to update the Konica Minolta branded lenses using the newer Sony branded lenses. One of the joys of living in Arizona is watching the occasional above-ground atomic bomb test from east of the Rincon mountains desert sight. I captured this scene from the comfort of my living room so no need to worry about the pesky heat and wind. As you may have guessed, I've doctored this photo up pretty heavily in ACDsee 9, my favorite file browser and quick-fixer. This picture actually shows a typical "monsoon season" thunderstorm session. I thought is looked a bit ominous, especially done up in red-orange, hence the over-enthusiastic initial description. The foreground silhouette is the ridge-line of houses (used in many of my telephoto shots) running north-south about 300 yards away. The thunderstorm was probably 20 miles away. Here's the review of the Sony 50mm F/1.4 I so shamelessly postponed for a couple of weeks, sorry folks. But now that it's here, check it out. I bought this at B&H for $309, and had another good shopping experience. No, I don't get paid anything for the plug, I just like their prices and service. This little prime lens turned in a very good performance, though I have to wonder who will be carrying one around on their camera? If you like real sharp photos and nearly zero distortion, CA and flare, this is your lens, scan my review to see if it meets your needs. Here's another installment in the not-yet-famous "Idle chat room." I was too lazy to actually go to a fireworks show, so I just stuck the 75-300mm lens on my Sony A100 and began shooting from my patio. Things went pretty well, there was a lot of dust in the air from a day of wind but overall, a good evening. The cheap lens handled the task well, and believe it or not, I found the high CA (mostly blue) of the lens probably produced a better shot than without it. If you want to waste a few minutes, check out the five small shots and one full res shot of some lame fireworks in Tucson AZ. Click the picture on the left or here for the page. Wow, It's July! As you know, I'm way behind on my lens reviews I promised. I've been trying to rent a Nikon 105mm macro lens for the past month, but they're always "out" and available at some point later. So I'm going to change the order of things starting off (hopefully next weekend) with a review of the Sony 50mm F/1.4, which won't be earth shattering but never the less interesting for Sony A100 owners. Then it'll be the Tamron 18-250mm, which is generating heavy interest. All the lens tests will be in the Sony/Minolta mount. Just check the Coming up page for everything on the list. On a final note, the Sigma 100-300 F/4 is on back order but I still hope for a review by the end of this month. 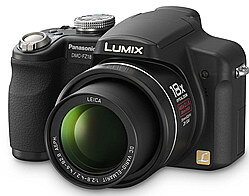 Also, keep in mind the review of the 12MP Panasonic Lumix DMC FX100 which will begin as soon as I can get one.